The triumphs of the original Mortal Kombat trilogy have cast a long shadow over a quarter century of kung fu fighting. 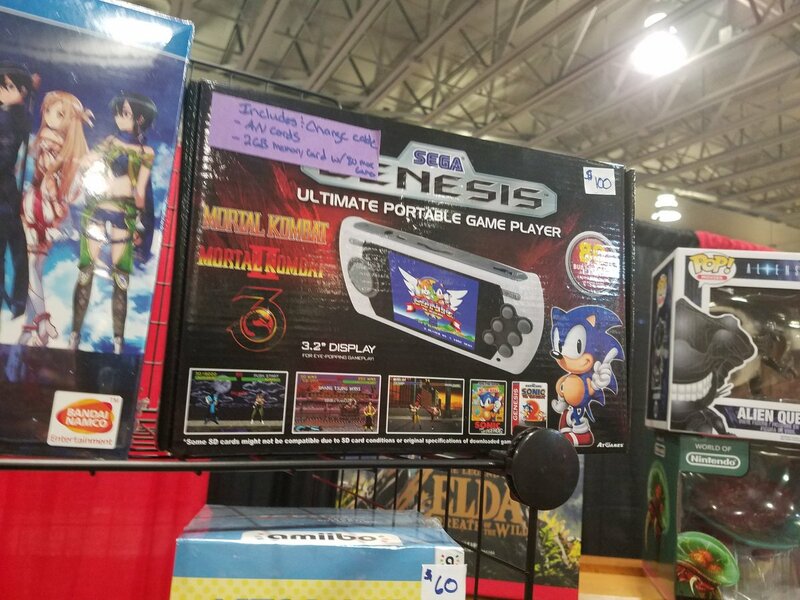 Fans eager to relive the thrills of klassic kombat, or discover an era of 16-bit gaming for the first time, will have a new economic way to scoop up history with the latest plug 'n' play edition of the Sega Genesis. The newest version of the Sega Mega Drive Classic Game Console maintains a boastful new line-up of 80 games in its built-in emulated library. The list includes usual suspects like the complete Sonic the Hedgehog series, interesting oddballs like Chakan: The Forever Man and Eternal Champions, as well as headlining Sega ports for: Mortal Kombat, Mortal Kombat II & Mortal Kombat 3! Sega ports by Probe boasted a notably fluid experience for the time, utilizing six-button play and full Mortal Kombat iconography - including blood and fatalities missing from some competing versions. Before you get too excited about the value of the economy purchase -- the "bonus" games threaten with a list of titles like: Cross The Road, Curling 2010, Fish Story, Plumbing Contest, Wall-Breaking, Warehouse Keeper, Naval Power, Mr. Balls and the delightfully forthcoming: Hidden Agenda. At least some of these shovelware games may actually be considered corporal punishment for heinous crimes in parts of the world. More of the list can be found on the Smyths Toys website. This generation of clone consoles also boasts the added benefit of a cartridge slot, allowing you to revisit your original library of games, but if that sounds too good to be true on top of the built-in majesty of Jack's Pea, it may not be all it's cracked up to be. Jeremy Parish of US Gamer raises concerns about the quality of the hardware: "Rather than incorporating original Genesis hardware — despite the cartridge slot — they run on mediocre emulators that don't offer full compatibility with cartridges. Inexplicably, they don't even offer save support for carts that include battery backup." The Mega Drive clone console is also limited to composite cables, lacking the modern HDMI outputs.supported by Nintendo equivalents. When it comes to capturing the original Mortal Kombat experience, most fans will want to choose modern console and PC options, like MK Arcade Kollection. For those who don't have the latest hardware, and are looking for some quick and easy thrills for £49.99 [via Argos] - wireless controls and kusoge curiosity might just be worth it! Had a plug 'n' play console experience? Love retro gaming? Register to share your thoughts and nostalgia on the 2D Kombat Klassics forum! Like and share stories like this via @MK_Online and Facebook. 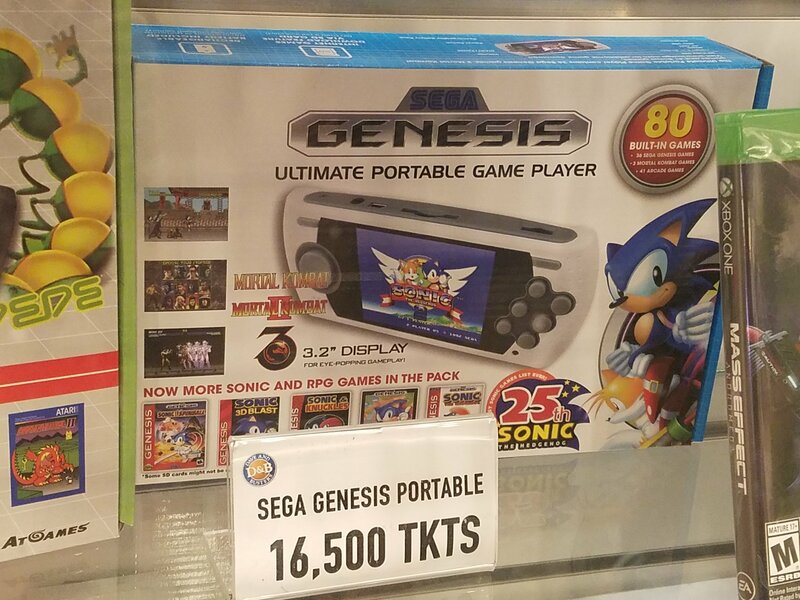 Here is a similar model I saw at Toys R Us, here in the United States:<br/><br/><a href="http://imgur.com/c6YjUs5" target="_blank"><img src="http://i.imgur.com/c6YjUs5.jpg" border=0 width=324 height=183"></a><br/><br/><a href="http://imgur.com/K9ZGE0r" target="_blank"><img src="http://i.imgur.com/K9ZGE0r.jpg" border=0 width=324 height=183"></a><br/><br/>This one was released by AT Games:<br/><br/><a href="http://retroproducts.atgames.net/index.php/products/sega-genesis/classic-game-console/" target="_blank">http://retroproducts.atgames.net/index.php/products/sega-genesis/classic-game-console/</A><br/><br/>Notice the screenshots on the box are from the arcade version, rather than any of the console ports. Notice the screenshots on the box are from the arcade version, rather than any of the console ports. 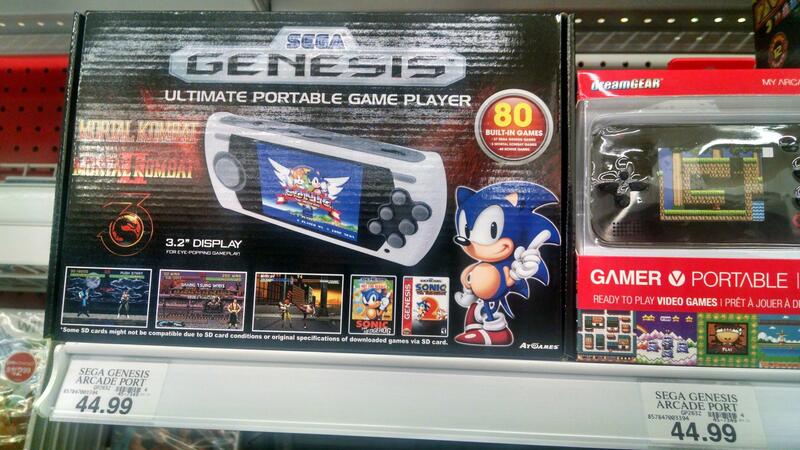 I don't know about the PAL version, but the American version from AT games has Streets of Rage 1, 2, and 3. So there's a couple of different models out there, all of which contain Mortal Kombat 1, II, and 3. Dave and Buster's offers these as prizes from time to time. <br/> <br/>I found one back on <A Href="https://twitter.com/tabmok99/status/795081606717468672" target="_blank">November 5, 2016 for 16,000 tickets</U></A>: <br/><Img src="http://tabmok99.mortalkombatonline.com/dave_busters_prize_1.jpg" width=500 height=375> <br/> <br/>I found another one on <A Href="https://twitter.com/tabmok99/status/848275115968212992" target="_blank">April 1, 2017 for 16,500 tickets</A>: <br/><Img src="http://tabmok99.mortalkombatonline.com/dave_busters_prize_2.jpg" width=500 height=375> <br/><br/>Inflation.<br/> <br/> Edit - April 16, 2017 - Yesterday at Supercon Retro in Miami, I saw it for sale again, only this time, <A Href="https://twitter.com/tabmok99/status/853287887915417600" target="_blank">it was going for $100</A>: <br/><img src="http://tabmok99.mortalkombatonline.com/genesis_at_supercon_retro.jpg" width=500 height=375> <br/><br/> Talk about inflation. 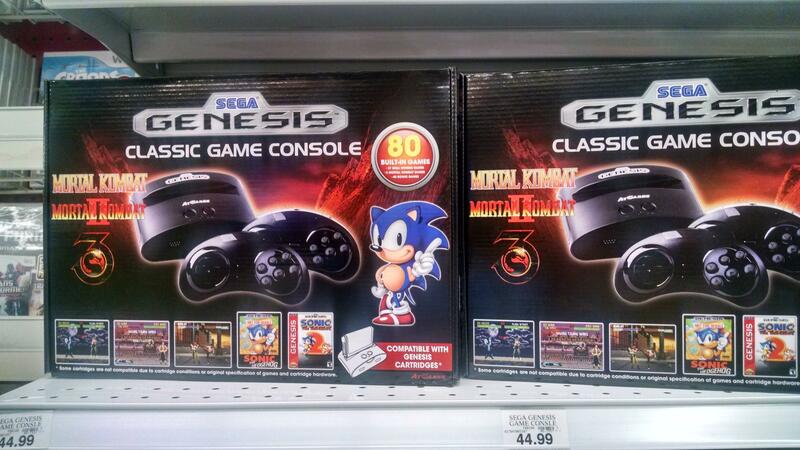 So there's a couple of different models out there, all of which contain Mortal Kombat 1, II, and 3. 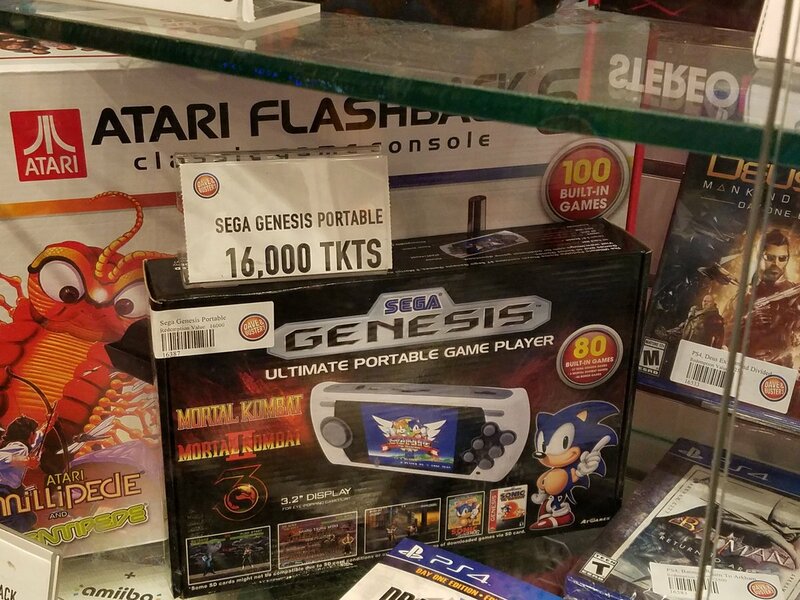 Dave and Buster's offers these as prizes from time to time.